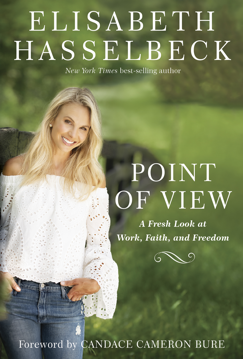 New York Times best-selling author Elisabeth Hasselbeck will host two Florida book signings where she will meet fans and sign copies of her new book, “Point of View: A Fresh Look at Faith, Work and Freedom” – named one of the most anticipated books of spring 2019 by Publishers Weekly. Barnes & Noble in The Villages, located at 1055 Old Camp Rd., will host the author on Wednesday, April 3, at 1:30 p.m. Contact James Sands at (352) 430-3029 or at [email protected] for more information. The Books-A-Million Lakeland store, located at 1520 Town Center Drive, will host the author on Wednesday, April 3, at 6 p.m.Tickets are available now and include admission as well as a copy of her new book. Contact Haley Sheram at (404) 233-3993 or [email protected] for more information. Tickets are $25 and can be purchased in advance at hasselbeckbam.eventbrite.com. Each ticket includes entry to the event and a copy of “Point of View: A Fresh Look at Faith, Work and Freedom,” which fans will receive upon arrival and can have signed during the meet-and-greet portion of the evening. In this book, the Emmy Award-winning talk show host and former broadcaster presents a deeply intimate journey of her faith and the pivotal moments that tested and strengthened her relationship with God along the way. From “Survivor” to “The View” to “Fox & Friends” to her current role as CBO (Chief Breakfast Officer) for her family to being hired, fired and retired, Hasselbeck has been inspired to have more Godversations and less condemnation.